This entry was posted in A Grand Plan, Beyond 416, Downtown Relief Line, GO Transit, Transit. Bookmark the permalink. When the housing bubble burst, Toronto’s over reliance on the F.I.R.E sector will stop any ‘recovery’ in its tracks. Besides a couple of dead cat bounces after decades of stagnation are not enough to state that the city is on a new path. Have a look at page 31 here. There is a need for fast regular services between the Peel region and Toronto’s core. There is a need for fast regular service on the Stouffville corridor. We do not need one gigantic big line to meet those two lines. Not only that, but except for the Lakeshore line, we should keep Go train lines going from the Peel region (and the Barrie line) away from Union. There is definitely strong demand for trips to Toronto’s core. Aside from the busy Lakeshore GO service there is overcrowding on the Milton line trains (hence the 12 car trains) and the buses which run after the trains are overcrowded too. This really makes Metrolinx’s refusal to push for two-way all-day (frequent?) service on the Milton Line a source of annoyance. Even the addition of a few later train trips would help a lot. Beyond the trips to the core, demand for GO buses bound for York University and Yorkdale is very high. GO’s Square One Terminal is their second busiest after Union, and with the opening of the Mississauga BRT/transitway next year (and its hoped-for completion by late 2015) I expect demand for GO bus services will increase. This unmet demand does not justify the “Big U” as currently proposed … nor does it justify the long-hoped for Crosstown GO line running along the St. Lawrence & Hudson railway line which could potentially connect “Meadowvale to Meadowvale” … but it does suggest that these lines have potential for growth. Instead of adding confusion with the Big U, it would be better if Transit Panel focused on getting the public onside for the funding proposal so we can build well-planned, well-placed lines when the time comes. I don’t think the growth downtown will continue at its present rate forever. Eventually congestion itself will cause things to level off, and development will go elsewhere. The problem is the city keeps approving more and more development in places that can’t support it. King can’t support another three 80 storey condos for Pete’s sake. Don Mills and Eglinton is a nightmare to commute to because of the congestion on the DVP, and that might be a contributing reason to its decline as an employment node. I know many people who refused job offers from companies there after they saw what the traffic was like on the way to the interview. Many 905 residents I spoke to who found out the hard way eventually found jobs in other 905 office parks after sticking it out for a year. Right now it’s cool to live downtown, but it might not be 20 or 30 years from now. Already some people are predicting that all of those downtown condos will be the slums of the future. Who knows … only time will tell. As for the other comments, I have nothing against subway interchanges that were properly designed with that purpose in mind. Ours were not. Our subway map looks like a dislocated shoulder. A “U”, and straight east-west line that forces almost everyone to transfer, SRT and Sheppard stubs where again everyone is forced to transfer, and now another backwards “L” of a stub for a DRL, which will most likely start at Pape and end at Union. Show me another city with a layout like this. Look at what BART, WMATA, NYC, and London all do. Is it witchcraft? No, it’s called railroading. I’m not saying that every line should mesh with every other line, but we are too much to the other extreme. A “U”, and straight east-west line that forces almost everyone to transfer, SRT and Sheppard stubs where again everyone is forced to transfer, and now another backwards “L” of a stub for a DRL, which will most likely start at Pape and end at Union. I’m not saying that every line should mesh with every other line, but we are too much to the other extreme. I agree with this idea, except that the DRL/DML is a step towards moving away from our extreme of non-meshed lines. My position for several years on subway expansion is that any new subway construction must be network enhancing and not simply radial extensions. What do I mean by this? Basically that a new subway project should connect with the current subway network in at least two places. One exception to this would be a line extension that provides a benefit to the system beyond simply reaching a little further (e.g. : extending Yonge up to Steeles could provide the ability to turn back some trains there and some at Finch in order to run trains more frequently south of Finch). In other words, a new subway not only has to be justified by demand requirements on its own, but have a function that benefits the network as a whole. The DRL/DML serves this purpose by connecting to the existing subway network in three places (St. Andrew, King, and Pape/Donlands). This increases capacity on the existing network where it is most needed, but it also provides a means of alternative routing for commuters. Problems occur on the network and the ability to get somewhere with another choice is badly needed in our system. The DRL/DML is not the panacea that gives us a meshed network, but it is a significant step forward from where we are now. I assume that you are talking about actually moving trains through the interchange from one line to another and not passengers. If you check the headways operated on line that do this type of change most are less than Toronto’s headway. In order to do a mesh you need all lines to run a headway that is a multiple of a minimum value so the lines can mesh. If you do not do this then you will have chaotic meshes, if you do you will probably operate too much or too little service on parts of the line. If you run a line that has 3 branches with a common headway of 3 minutes then the headway that is useful to you now becomes 9 minutes not 3. You may not need to make a transfer but you wait a lot longer. This can cause platform crowding, especially if one branch drops a train. Toronto is trying to run a grid system, not a spaghetti system. If you are talking about passenger interchange from trains on one line to trains on another then Toronto has relatively simple connections. You can walk for blocks underground in London to get from one line to another. This also happens in Milan which is a relatively new system. St. George would be a perfect interchange if westbound Bloor was on the same level as northbound University and southbound with eastbound but the TTC had to build the system to allow for the integration and this prevented it. Sheppard line was never supposed to be built so no provision was made for it in the original design of Yonge. The cost to provide an interchange capability from one line to another by moving trains is an exercise in wasting money, resources and land. Actually it can be argued that it is stupidity. The only place where a reasonable argument can be made for branching is towards the outer end where half the trains can go to different destinations. Robert — let me give you an example. We often hear Steve talk about the terminal crossover constraints at Finch that prevent the headway from going below 110s. He’s right about that. And, you would need split-second timing to accomplish that and maintain it. When a 120s headway was attempted at Finch in the 70s, it didn’t work. Rush hour would end 15 minutes behind schedule every day. Now, suppose Sheppard had been built to standard length with the allowance for it to operate as a branch of YUS ore as a separate line, as any reasonable city might have done (since it was obvious that stub of a subway was never going to go any further east or west). With that junction, it would have been possible to mesh those two services and eliminate 50,000 forced transfers at Sheppard-Yonge (as most are going south in the AM and east in the PM). 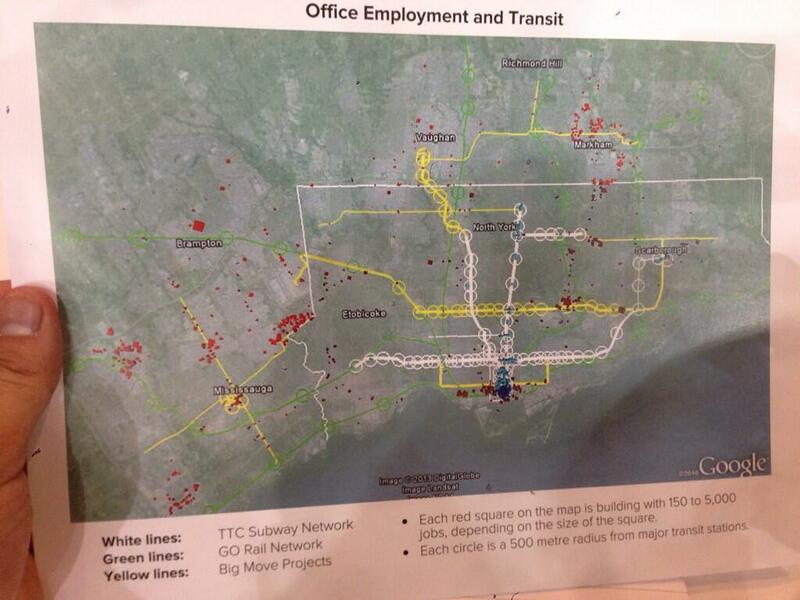 However, 100,000 riders to/from Finch would be inconvenienced 1/2 the time, so the overall change would be neutral. I’m using all-day numbers here, but this could be done during rush hours only. Don’t tell me that the TTC couldn’t operate a simple junction like that and accomplish the short-turn strategy that is now needed to get the headways south of Sheppard below 100s with the new signal system. Even in the 60s as I wrote earlier, the trailing points in the wye could operate in FCFS mode very efficiently all by themselves — that is, whichever train hit the trailing route selection point first seized the route and went through, irrespective of the timetable. The TTC did not use this mode, but it was there. Now we’re spending a ton of money on the Scarborough subway to eliminate a transfer, and it looks like the Sheppard LRT will be dead as a result because they’re now talking about killing the carhouse completely. Why kill it if it’s still needed for Sheppard? You see what a transfer will do? In simplified terms, the current GO system is only designed for 905ers to get to and from Union Station. It does a poor job for anyone that is not going to/from Union, and it does a poor job for anyone going a long distance across the 416. More stations need to be built in the 416 to transform the system, and have GO take a greater load of passengers (as Steve advocates). If you look at the station spacing, it is huge in Toronto. It makes no sense that the station density is the most sparse where the population density and employment density are highest. There is much talk about all-day service on GO, but I don’t see the ridership being high without more stations in Toronto. The Crosstown LRT plans talk about future GO connections, but is this lip-service, or are there actually plans to build these stations? You would end up operating a 4 minute headway on Yonge north of York Mills as the interchange would need to be between York Mills and Sheppard in order to get under Sheppard. So would you cut the service to 3 stations to eliminate a transfer for 50,000 passengers a day? Compare the number of passengers who would be inconvenienced. Trains leave Finch with standing room only crowds now. Cut the service in half and what would it be like? It is much better to spend the money extending to Steeles and turning half the service at Finch. Have you considered the implications of building the interchange that you want? The north to east curve would be relatively simple but it would start on an upgrade because Yonge is on one and what would it go under. The current single track is a slow speed equipment only line, not a service speed one. The west to south curve gets more interesting because it would have to duck under the non rush hour branch that continued to Yonge then go either over or under Yonge to come down to make a connection deep underground in a tunnelled section of line, not an easy thing to do. You would also increase service on Sheppard from a 4 car train every 5 min 30 sec to a 6 car train every 4 min. One branch gets too much service and the other not enough, which is one problem with meshing 2 services. The change would not be neutral because the 200,000 or more riders who ride north of York Mills, not Sheppard, would be inconvenienced. Hurt the many to help the few? What kind of logic is that? And you would also have built the current Yonge station on Sheppard for off peak service. That would be really wasteful of resources and if you are coming south to go east on Finch do you get off at Sheppard or York Mills or would you run a 4:00 headway on Sheppard to Yonge during rush hour wasting even more money to provide a one seat ride for the few? First come first serve route selection, even for trailing point, is going to get your system so screwed up when you are on minimum headways as you will end with 2 Sheppard trains in a row going up Yonge. You have to look at the consequence at the other junction. Want to guess what the platforms would look like? The Transportation Research Board, from computer simulations and actual practice, estimates that ATO will result in a capacity increase of about 2 – 4%, not 10%. When thinking up complex schemes remember Murphy’s Law, anything that can go wrong will go wrong and O’Toole’s corollary; Murphy was an optimist. You know, a cheaper and more effective solution to decrease headway on the Yonge line would be to replace the outer two dead end storage tracks to the north of Finch with a loop. The only questions with that is how far north would the loop end up going to avoid building foundations, if it’s possible to avoid them at this point, and whether it would be possible to extend the line north without abandoning that loop. It is not a funding issue. It is a cultural issue. Firstly, public transit subways/trains in Japan are not 100% private. You, nor I, or anyone else from Canada [can] ever comprehend what happens in Japan. [The] Private sector in Japan in some cases are large corporations that build/manage hotels and malls, that make the Ontario/TTC/Metrolinx plans look minimal. Last week I walked through Union Station. Union Station needs work, like a lot. The Eglinton-Yonge Station is a joke. Japan Rail, a centralized government entity, had very serious financial problems in the 90’s. Please note. So 100% centralized government management may be not the answer. In Tokyo there are two subway lines/corporations plus JR East plus a number of private rail lines. Actually, there are so many that if you try to study a Tokyo subway/train map you end up with a headache. They all get along. Well maybe. But they know how to move people. There is no way you can argue the contrary. There is a lot to learn from Japan. To ignore their system or dis it is not the way to go. Steve: I am not sure exactly what point you are trying to make. Yes, the transit systems in Japan know how to move vast numbers of people, and there is a lot to learn about what is operationally possible from those system. There is a myth put about in these parts that the Japanese systems are all privately financed companies, but this is not true as you note. There is substantial government support either through direct subsidy or investment, and by favourable arrangements with conglomerates that operate transit lines among other businesses. This is, as you say, a matter of local culture and history. The important issue for Toronto readers is that we cannot simply “import” the Japanese model and expect it to provide spectacular transit at little or no public cost. Union Station as you know is undergoing a massive facelift, although one can easily argue that this will only handle projected demand out to the late 2020s, and more will be needed long before the current investment is depreciated or recouped. That project encountered very strong resistance from potential funders and the scope is constrained even though it is physically a very big project. Yonge-Eglinton suffers from being part of the original 1954 Yonge subway, and there was a long period of indecision about the future of the TTC lands at that location. There is a new plan for this station to connect with the Crosstown LRT subway that will substantially add to the circulation space of the station taking into account the shift of transfer traffic from bus feeders to the LRT and the expected increase in demand. Even the new design is not ideal, but we do not have the luxury of demolishing high-rise towers that the subway runs under just because another platform here or there might be a useful addition. The problem is that the TTC wants to build larger diameter curves than in the past to reduce wheel and track wear. If the minimum desired curve radius is 300 m it will be a loop of over 2 km around (2pi time 300 plus a bit). If you use 500 m then you need over 3.3 km. I know that they have used tighter curves but they are a problem that they want to avoid repeating. The cities that do use loops like Chicago run much shorter cars. There is also the problem that the curved tunnel would probably go in awkward locations, like through the basement of a highrise. It is much cheaper and more efficient to operate multiple turn backs to reduce the headway. Steve: A related problem is that additional trains are required for the extra mileage the loop represents. If the minimum desired curve radius is 300 m it will be a loop of over 2 km around (2pi time 300 plus a bit). If you use 500 m then you need over 3.3 km. I suppose the only way we would see a loop at a subway line terminal in Toronto would be at Pearson Airport … if Pearson were busy enough to be served by full subway along with express and local rail lines … something like Heathrow and the Picadilly Line. There is also the problem that the curved tunnel would probably go in awkward locations, like through the basement of a highrise. Hence my comment about the problem of needing to avoid building foundations. And while I do agree about it being better to use multiple turn backs to reduce headway, my comment about constructing a turn back loop at Finch was in contrast to the cost and complexity of interlining the Sheppard line with the Yonge line in an attempt to achieve the same goal. Basically it was the “If you want to spend money to build something, at least build something that might actually work.” viewpoint. I thought that at one point (1990?) the ttc was considering loops at Yonge & Steeles (around the mall) and at York University, rather than extending the subway into the 905, as the other solution was to run a line along Steeles to make the entire YUS a big loop, like a kid’s train set. Steve: The only loop the TTC considered was to link the top ends of the Yonge and Spadina lines. When this was originally proposed, that would have been at Sheppard (and that’s where the Sheppard West subway came from, not from any inherent demand). As the lines pushed north and further apart, a loop arrangement became less and less viable because of the wasted mileage. The most northerly version I ever saw on a proposal was at Steeles. Now the Spadina line is going to Vaughan and the Yonge line, eventually, to Richmond Hill. A gigantic circle line is simply out of the question. Loops are wasted track … maybe it would be better in the long run to have the line run longer and have 3-4 tracks so that trains can reverse 2 at a time … more like a mini marshalling or storage yard – with eventually only 2 of the tracks being extended if the line is extended. The other option might be to eventually have branches/splits in the YUS and B/D lines, with trains being split 50/50 on each part. As the lines get farther away from the core, the capacity drops and trains not need to run as frequently … maybe the Sheppard line, if it went over to Allen, could do this as a means of getting riders to avoid the Yonge section – people avoid a wait and transfer if they take the longer route. Steve: As others have pointed out in this thread, the problem with your scheme is that it presumes that demand drops off on the outer part of the lines where a split might occur. In fact, on the Yonge side, all of the service is needed to Finch to handle peak demand. Any sort of branching south of there would reduce the Finch service to a level where it could not handle the riders. If the desire is to turn trains back at one location (instead of some at the terminal station and some a little further down the line, or by having branches at the end of the line), this can be done with two (or more) centre pocket tracks beyond the station. This is actually done in Melbourne on their tram network at Melbourne University, just north of the CBD. Nine tram routes arrive her from the south with seven of them turning back and two passing through to the north. They have THREE pocket tracks north of the station for turning back as during rush hours trams arrive from the south about every 90 seconds (or less). This is exactly what I am talking about. Inevitably, there will never be the need for as many trains to be running all the time all the way to the end of each line. to then go to Yonge and Sheppard, so that only some trains (50%?) run the full line. I recall that the TTC used to short turn trains at Eglinton in the early years after the Yonge line was extended north of Eglinton… I used to go to York Mills to get the bus. Steve: There is already a proposal for a pocket track north of Finch so that part of the service can be short turned there rather than going to Richmond Hill, and in support of a more frequent blended service south from Finch. Similarly, all of the service on the Spadina extension will not go to Vaughan. The real challenge comes if there is so much demand on the outer end of the line that all service must run through to the terminal. Loops are the most efficient way to reverse a large number of trains due to inbounds never interfering with outbounds. It’s only a question of whether that advantage is more important than the costs associated, and land availability, with the much larger footprint it has compared to a switchback. Also, any extension to the north of Finch has to take into account the future Cummer-Drewry station. Steve: Loops are a possible idea when there is space for them, and where the number of extra trains needed just to fill the loop is small. This does not apply to the locations we are discussing, so can we just end this debate please? There is already a proposal for a pocket track north of Finch so that part of the service can be short turned there rather than going to Richmond Hill, and in support of a more frequent blended service south from Finch. Similarly, all of the service on the Spadina extension will not go to Vaughan. The real challenge comes if there is so much demand on the outer end of the line that all service must run through to the terminal. So, what is your view on extending the Sheppard line west to the Allen line? Would this not help alleviate some of the problems at Yonge/Bloor? Steve: No it would not. The people who are on the subway at its north end already are on a train and they have no incentive to get off to make space for more riders to the south. This would take them well out of their way and add one, maybe two transfers (one at Sheppard-Yonge, another at Downsview) to their trips. The distance from Yonge to Downsview Station is about 4km. Even allowing for the structure that already exists west of Yonge, we are easily looking at $1b worth of infrastructure. I continue to be amazed by schemes for this sort of diversionary arrangement when we are always told we have no money for actually useful work such as the Relief Line. This situation is entirely one of the transit planners’ and advocates’ own making. In putting LRTs first, they prioritized local over regional, when in reality most people care far more about regional travel because that impacts them everyday (ie. commuting, accessing specialist health care, etc.). All the fights over subway vs. LRT could have been avoided if more money was first sunk into turning GO into a true regional transit service that is properly integrated with the TTC. B) You can ride a bus for 20 mins that gets you to a subway that still requires another transfer at Yonge and gets you to Union in 50 mins from the terminus. What would this rider pick? Steve: I agree, but at the point when Transit City was proposed, GO was showing no signs of major expansion of services within the 416 (their conversion to this view is only months old). Toronto had no way to propose a GO service to Malvern as a solution. I have long argued that this is badly needed, but that doesn’t make the LRT proposal invalid. Many trips are not going from the outer suburbs to downtown, and it was those trips Transit City sought to serve.